Xcessive's bolt on plenum kit for the SR20VE motor is designed to take advantage of the factory short runner lower section and dramatically increase flow for boosted motors. With a smooth radius on the plenum adapter plate and significant increase in plenum volume, air flow will be dramatically increased in the upper RPM. Our two piece runner/plenum design also allows for easier porting and polishing of the intake than standard welded designs. 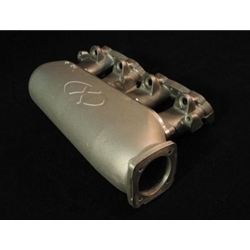 The new plenum is permanent mold cast for superior finish and casting soundness with a phenolic shell core used for internal walls to yield some of the best quality available. The plenum is drilled for the factory throttle body and bolt pattern but comes pre machined for up to a 70 mm bore (Up to 80 mm bore available and custom bolt patterns as special order, call prior to ordering.) Add $25 for Q45 TB pattern, add $80 for N1 TB pattern. Stock SR20VE runners not included! !